One of the deficits for current Blu-ray discs are the limitations in capacity for data back-ups. The upcoming 200GB Blu-ray media overcomes that obstacle and is targeted at the archival and back-up market. With so much digital content being created and stored in the â€œcloudâ€, companies and governments need a method to securely store this content on a physical media as a back-up. Optical discs are the most reliable medium for back-up as the discs do not have physical contact with the read/write head or continuously spin, preventing the potential erosion that can happen to tape or HDDâ€™s. This makes the 200GB Blu-ray disc a reliable back-up and archival solution for all important or critical data stored on a hard drive or in the cloud. With the recent BDA approval for the licensing of an optical disc technology that can handle high-resolution 4K video, the next step is finding a media that can hold the massive data and files created when producing 4K content. The discs themselves will allow the user to burn content on both sides of the disc, approx. 100GB per side, doubling the current BDXL disc capacity. Now that the BDA has approved the specifications, it clears the way for media manufacturers to begin production and bring to market these very large capacity recordable discs. Look for this new media to be hitting the market in the near future. 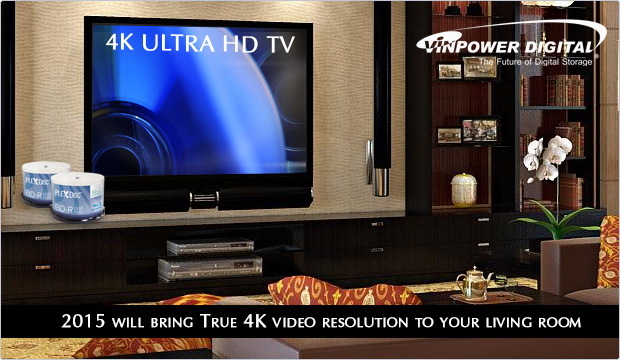 For more details about Blu-ray media or duplication equipment, contact your Vinpower representative today. When you purchase a movie you really enjoy and plan to watch it over and over again, or just want to have it as part of your collection, most people prefer to have a physical disc rather than a digital file. The disc itself tends to represent a higher quality and longevity compared to compressed content that shares space in the cloud or on a HDD with funny cat videos or their kidâ€™s birthday party. Thereâ€™s something to me said about watching a movie with full HD quality and sound on a large screen TV that evokes ones emotions and keeps your interest in the story. Streaming a movie through a computer or even set top devices like Netflix is ok for viewing a movie once, but when you decide to own a movie for your collection, DVD and Blu-ray discs are still the preferred choice. Soon it will be even more desirable to own an actual disc for your movies, thatâ€™s because of the Ultra HD capability of 4K resolution. The Blu-ray Disc Association (BDA) announced the licensing of an optical disc technology that can handle high-resolution 4K content. Itâ€™s anticipated that production will start by the spring 2015, bringing true 4K resolution to the home theater by the 2015 holiday season. Even as video streaming becomes more popular, the bandwidth necessary for true high definition content, like 4K video, is simply not available in most locations. Thatâ€™s why optical discs will still be a mainstay for home viewing audiences when it comes to movies and TV shows. Optical Discs are still the most cost effective and largest capacity method of storing video content, especially large capacity high definition material. Plus thereâ€™s no big technology shift like there was when VHS loss favor to DVD. Optical discs technology will continue to expand as laser technology improves, just as 700MB CDâ€™s gave way to 4.7GB DVDâ€™s and then 25GB Blu-ray and so on and so on, all the while remaining backwards compatible. That means all your past and future optical disc content will certainly remain relevant and easy to enjoy for many years to come! Whether you are an early adapter or you like to wait until new technology is out for a while and the prices drop, Blu-ray technology will be a wise investment now and into the future. For more details about Blu-ray media or duplication equipment, contact your Vinpower representative today. 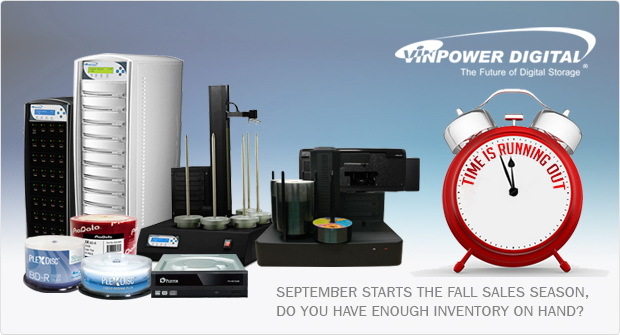 September starts the fall sales season, do you have enough inventory on hand? September is a crucial month for retailers as it is when both the state and federal governmentâ€™s fiscal year comes to an end and students head back to school. In fact, many government agencies must use up any remaining budget on the books before the end of September, the new budgets and fiscal year begin on the 1st of October. So the combination of workers coming back from long summer vacations, schools starting their new educational years, and governments looking to spend any money remaining in their current fiscal year budgets, often means big business to merchants with products to sell into those sectors. Duplication hardware, media, and supplies are very much in demand across these sectors and itâ€™s important to make sure that you are stocked up as time is limited. For government in particular, anything they order has to ship and be invoiced prior to October 1st, or they wonâ€™t be able to apply it to this yearâ€™s budget, causing the transaction to count against the following yearâ€™s budget. So if a vendor is not prepared and doesnâ€™t have stock on hand, they could lose the opportunity and potentially miss out on future sales. Donâ€™t take any chances, contact Vinpower today and make sure you have enough inventory or time to order the necessary blank media and duplication hardware/components you need to fulfill your upcoming orders. Vinpower is fully stocked and ready to work with you, speak with a Vinpower representative for all your duplication hardware, media, and accessory needs. Over 100 celebrities had hundreds of pictures of them stolen from the cloud and posted online, doesnâ€™t sound too secure. With the revelation of an anonymous hacker stealing hundreds of private images stored in the cloud, from over 100 celebrities, goes to show just how vulnerable the cloud can be for your digital content. Not only are the files stored on the cloud at risk from potential hackers copying the content, but that means they could also delete, alter or infect them with a computer virus as well. That places a lot more than just your memories or reputation at risk, but could bring down companies if critical information fell into the wrong hands. Thereâ€™s only one secure method to copy and store digital content where that material cannot be accessed remotely, altered, or deleted, and thatâ€™s by using optical discs. Using recordable CDâ€™s, DVDâ€™s and/or Blu-ray media is the best method to ensure that your digital content will not fall into the wrong hands or broadcast across the internet. So if you care about your content and want to make sure that itâ€™s safe for you and your client base, then you should contact Vinpower Digital for pricing on the latest in digital duplication hardware and media.